After this group research, we began doing individual research on another example of chemistry in cooking that we would construct our exhibit proposals from. I chose to do my research on liquid smoke, because as soon as I saw the name on the list of options I was captivated. The very first question I set out to answer was what exactly liquid smoke was. I discovered that it is a cooking ingredient that is used to give a cooking food the distinct flavor of smoke without actually having to expose that food to smoke from a fire. It is created when wood (whether it be applewood, hickory, mesquite, etc) is burned, and the smoke that is produced is captured, and then put under immense pressure so that the smoke condensates, producing a liquid that has the distinct taste and smell of whatever wood the smoke came from. This led to the creation of my exhibit proposal, as I wanted to combine this research with a presentation that another group had conducted on the correlation between taste and smell. 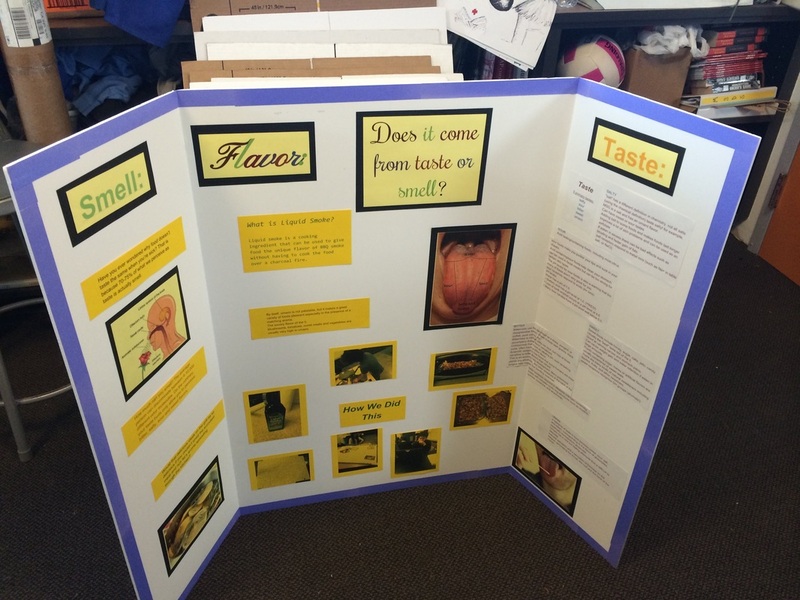 In my exhibit proposal, I combined the interesting research I had gathered about liquid smoke with information about the correlation between taste and smell to produce something that I believed would be attention grabbing. My activity required people to taste a walnut that had been cooked with liquid smoke that had bad flavoring, and smell a pleasing extract as they ate their nasty walnut. The point of this was to show that most of what humans perceive as flavor actually comes from our sense of smell, not taste. Then came the voting day, where we would vote as a class for the nine exhibits that would be presented during our Chemistry of Food Fair. Each exhibit was printed without the creators name, and then assigned a number. Then we had a gallery walk, and we had to write down the numbers of the nine proposals we believed to be the best. Finally, Aliza tallied the votes for every proposal, and mine was fortunate enough to be selected as one of the nine that would be presented at our Exhibition. Thus, for the final week of the project, I worked on the exhibit whose proposal I had created. The Chemistry of Food Fair was one of the biggest surprises of the year, because of what a success that project was. We essentially got a week to prepare for this exhibition, and it was extremely successful and was an incredible opportunity for team bonding. In my group I had two group members who I had previously worked with on the Water We Doing? Project, which is why I believe we cooperated in a much better fashion than most other groups; since we all familiar with the style of work of the other group members. When it came to designing the exhibit, each member designed the portion of the exhibit that corresponded with their research. That way, no member was overwhelmed with an excessive amount of work. As it was my proposal that was chosen for the exhibit, I was the project manager for this exhibition. I believe that this was the project where I did my best managing, because of how much was going on in our other classes while we did this project, and because of how little time we had to complete this project. I found myself listening to the ideas of my group members more so than in previous projects, and I made a serious effort in trying to include all of our ideas in our final design. I also was the one to supply all the materials for our exhibit, conducted all the cooking, and suffered the consequences (some of the ingredients smelled absolutely disgusting). In regards to how our group functioned, this was definitely the easiest group I have ever had to work with in all of my projects at HTHCV. We all supported each other, and stuck together through the stress and sleepless nights. I think we were so functional together because all of us understood what the others were going through. Usually where there is empathy there is successful communication, and when there is successful communication in a project-based learning environment good things tend to happen. I am extremely proud of our final product, as our trifold poster actually looked good, organized, and was informative. In addition, our activity seemed to genuinely interest those who came to our booth. I believe this could be attributed to how well our group collaborated and communicated to produce something that all of us could present with pride. When I originally found out about this project, I was honestly a little underwhelmed, because when I think of chemistry I think of the scientists working in laboratories studying bonds and structures of different molecules, and how they interact. I definitely do not think of cooking. When I began conducting my research, it was evident that this was a major misconception. Through my research I learned about liquid smoke; a cooking ingredient that I believe I would never have come into contact with if I had not done this project. Learning about liquid smoke itself was interesting, but what was so incredible was the process that companies use when producing this product, that can give food the unique, distinct flavor of smoke without ever having to actually expose that food to smoke. Another aspect of chemistry which I found fascinating was the correlation between taste and smell. When we asked people which they associated with flavor, taste or smell, most (if not all) said taste. I would have said the same before my research. I was literally shocked when I discovered that about 70% of what we perceive as flavor actually comes from smell, greatly outweighing the percentage of flavor that comes from taste. Another point that left me flabbergasted was that the average human can distinguish between 4,000 and 10,000 different odors, while your taste buds can only distinguish five different flavors (sweet, sour, bitter, sweet and umami). Having to present this information to my peers helped me immensely in gaining a deeper understanding of the topic, because you can only teach something to someone once you truly understand it. Some of the questions that peers asked after our presentation also sparked more curiosity in regarding the subject, and have inspired me to conduct more independent research over the summer when I actually have the time to do so. This project really helped expand my view of chemistry in the real world because it showed me that chemistry is not something that only happens in laboratories when chemists combine compound with compound to test a reaction; it showed me that chemistry happens every day, in every kitchen, and if you look for them, you will find the examples.